This level has hard difficulty. 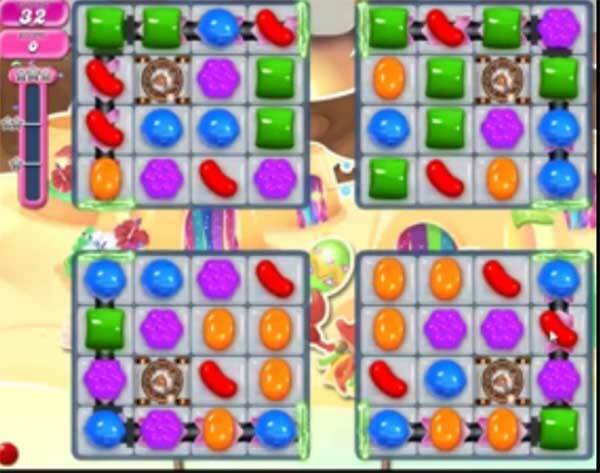 For this level try to play more from bottom part of the board and make striped candy as you get the chance. Combine striped candy with wrapped candy to break more jellies. After play with remaining jelly candy to break them all. Only have 24 moves on IPad and IPhone. No way to pass it. The video shows 32 moves whereas my game has only 24 moves. Very unfair. Why isn’t there a reply to theses questions? Only 24 moves on iPad and phone. I have only 24 moves not the 32 the video shows… how do I beat this. Impossible !!! Come on Candy Crush Team!!!! has a lot of players have already mentioned that on video 1335 it says that we have 32 moves to complete the game, so can you tell me and the rest of the people who play on this level only get 24 moves. I myself have lost a lot of lives and Gold bars trying to complete this level as l’m sure have other players, so come on Candy Team PLEASE get it sorted and give us the 32 moves. Just watched the walkthrough video for level 1335, and that takes 29 moves to complete out of the said 32 moves, so how can we the players do it in 24!!! Will not be spending any more money on this game until it’s put right, and l’m sure others will follow. this is a boring frustrating level,wouldnt like to think how much money i,ve spent in 2 yrs on this game,time to pack it in.who gets our money ? Bad level. I will give up candy crush ????? I have been playing for a few years and love it, but this level su**. Even spinning the wheel does not help. I like a challenge but not when it is this difficult. Level 1335 has 24 moves not 32 like you day it does. 20 moves just to take out the spinners. That leaves 4 moves for the rest of the board. Not possible. Give us the 32 moves like you advertise. Seriously. Good question! why dont our questions get answered? Does anyone even look at these posts? How to break spinning thing? This level isn’t even hard, it’s impossible! On that note, Good Bye candy crush. its a frustrating level not even fun to play anymore. king wants us to spend monry!! End up I use 4 booster to clear this stage!! Been stuck for few months!!! Candy crush developers did it again! They really need to be fired! I am not having fun. This is a horrid level! This is not possible with 24 moves. I have stopped playing ? Their Crooks. Their algorithms are not true to the rules of the game. Things that shouldn’t blow up do…especially when the next move will benefit you. They only let you off certain levels when they feel you’ve spent enough money.